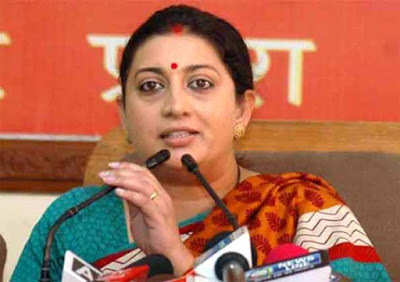 Mysuru : The Union Human Resources Development (HRD) Minister Smriti Irani says what we need today is ‘Science for Everyday Women’. Inaugurating the 5th Women’s Science Congress at 103rd Indian Science Congress at University of Mysore today, she said the most fundamental challenge today is to overcome unvocal prejudices against women. Commenting on prejudices we carry as a society she commented that, Science does not seem to be teaching us to overcome these prejudices even while it enriches our knowledge. While mentioning women’s contribution in all spheres of life Irani said, we easily recall names of the scientists who are men and very hardly do we remember any women’s contribution in the field of Science and Technology. Irani pointed that ordinary saree clad Indian women were the faces behind our successful Mars Mission. Among others present during the occasion were, Dr. Vijaya Laxmi Saxena, Executive Member, ISCA, Prof. Geetha Bali, Former President, ISCA, Dr. Soumya Swaminathan, Secretary DHR, DG – ICMR, New Delhi, Shobana Bhaskaran, Scientist SEED, Prof. Asna Urooj, Convener, Women Science Congress and Prof. Shobha Jagannath, Co–Convener of Women Science Congress.